When opportunities come a knocking….. If there is one thing I’ve learnt since being in Slovenia, it’s that when opportunities come a knocking, they must be grabbed with both hands. So last week I did just that – twice! The first occasion came about when, out-of-the-blue, I received an email a couple of weeks ago from an English couple, Marian and Eddie, inviting me to be their guest for dinner. I of course accepted with pleasure and intrigue. Marian and Eddie have been holidaying in Slovenia for over 10 years now and they visit at least 3 times per year. On a recent visit, whilst staying at their current favourite guest house, Penzion Alp in Bled, the owner told them about my blog and they have been following it ever since. This prompted the above mentioned dinner invitation and we spent a thoroughly enjoyable evening together, due both to their friendliness and ‘great Britishness’ and also to the overwhelming hospitality of the staff and presentation and taste of the food we savoured. It seems that as long-standing guests, Marian and Eddie are treated like old-friends but also pampered with extra little treats such as the wonderfully presented bread wreaths that were presented to our table (and only our table!) 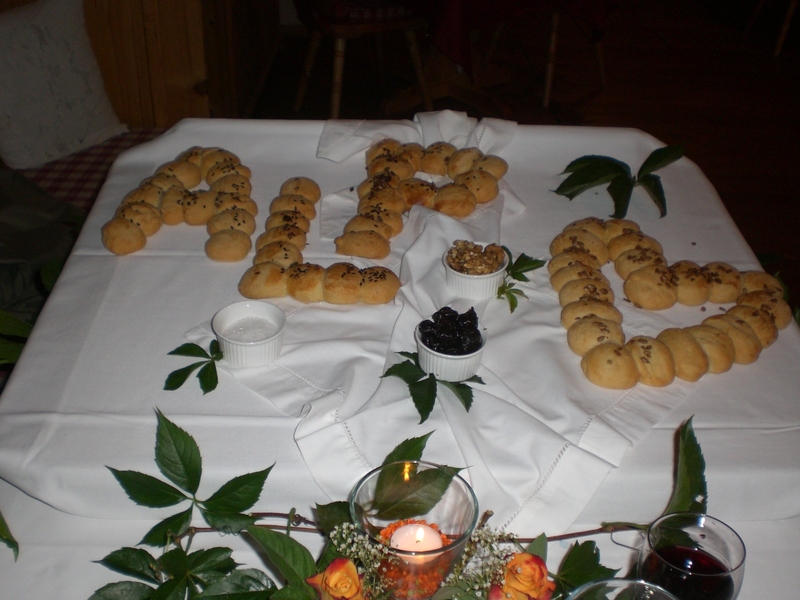 made up of lots of miniature bread rolls spelling out the word ALP, so cute – as seen below – and it really was a shame to eat them but they were tasty too! It was my first visit to Penzion Alp and I have a feeling it won’t be my last, especially since they are due to come back again at Christmas for their fourth visit this year. The couple are proof positive, as if it were needed, that there’s always plenty to see and do here; they love Bled and always visit Radovlijca and the surrounding areas too, and say ‘Slovenia never ceases to amaze them’. The second of last week’s opportunities came about following a chat I had with Radovjlica’s Mayor whilst at the Mošnje Days event the weekend before last. As a result, he invited me, together with Nataša Mikelj from Tourism Radovljica, to visit him in his office to acquaint him further with my blog. Again, this was another opportunity not to be missed, both in terms of the chance to be able to convey some of the amazing statistics the blog has achieved to-date and also to get a sneek peek into his office which was full of interesting handmade wrought iron pieces, such as the candelabra, coat stand, clock, desk tidy (some of which can be seen in the photo below) from the nearby village of Kropa, which is the cradle of Slovene iron forging (you can read more about Kropa here – http://www.radolca.si/en/kropa-old-town/). It was also more than satisfying to get some additional recognition and gratitude for all my hard work helping to spread the good word about Radovljica. Sunday morning started off rather cloudily but by midday the sun had broken through. It was a little on the crisp side but I wrapped up, gloves and all, and headed off on my bike. The lack of sun influenced my decision about where to go but thankfully the newly surfaced, and long awaited, missing part of the D2 cycle route connecting Hrušica with Mojstrana is now rideable and as it’s flattish too – a rarity round here – so ideal for an easier ride without too many ups and downs on a chilly early morning. It isn’t yet officially open as there are still some finishing works to be done but nonetheless I figured that being a Sunday the workers are most likely to be on a day of rest, and my calculation paid off! On Sunday afternoon I headed to Bled, which was looking magnificent in the brilliant blue sunshine with the glistening lake framed by the cloudless blue sky and majestic Karavanke mountains. It felt like, and was almost as busy as, a mid-summer’s day. 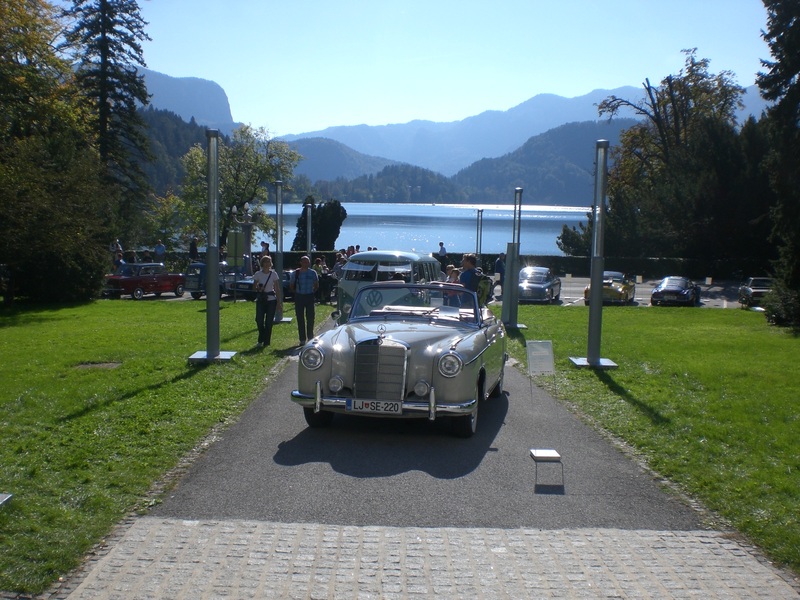 Additionally, there was an exhibition of old-timer cars in front of the Festival Hall which was drawing quite a crowd. Slovenia – A Land of Dreams? It was another busy week and, believe it or not, a WHOLE WEEK WITHOUT RAIN, well until the storm on Sunday evening but we won’t mention that little detail! Being about the first time that has happened since June, it is indeed something to write about! It’s funny how this year the appearance of the sun, or at least the non-appearance of rain, is actually a talking point in itself. Last week I mentioned I was hoping to go to Koper to the Sladka Istra Sweet Festival on Sunday, however, I didn’t go; though for once it wasn’t the rain that curtailed my plans but instead the major road works taking place on the motorway to/from the coast, meaning one lane is closed in each direction. On Friday there was a 20km tailback and I really didn’t fancy getting stuck in something like that especially since Sunday afternoons are notoriously busy with day trippers and holidaymakers returning from the coast. The road works are due to continue for another month so if you are planning a trip in that direction it might be wise to check the traffic information website for live updates, a link to which can be found in the ‘Useful Tourist Information’ section on the right hand side. On Wednedsay I met David and Leslie, a lovely couple from Kansas, USA, who were on a whistle stop tour of Slovenia, and who I helped with some of their trip plans. Despite being possibly the most jet-lagged people I’ve ever met, they stoically landed in Slovenia on Wednesday afternoon, checked-in at their hotel in Bled, went straight to Vintgar Gorge, then came to Radovljica where we met for a short tour of the old town followed by dinner at Lectar Inn; determined as they were to stay awake and adjust to European time. 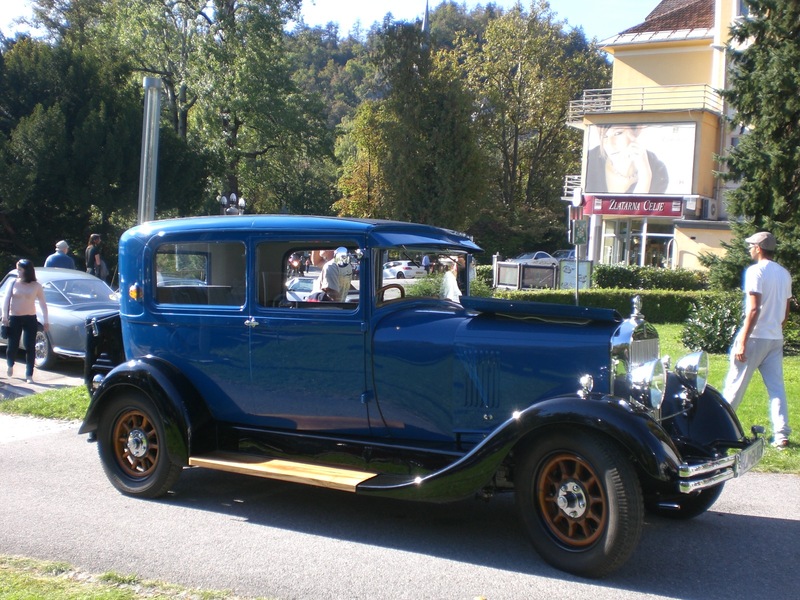 The next day they undertook a driving tour of the Julian Alps, including driving over Slovenia’s highest mountain pass, Vršič (1611m), which is no mean feat when they had never driven a car with a gear stick before! They survived to tell the tale though and thoroughly enjoyed their (all too) brief visit to Gorenjska. I also enjoyed a meal with a friend to celebrate her finding a new job. 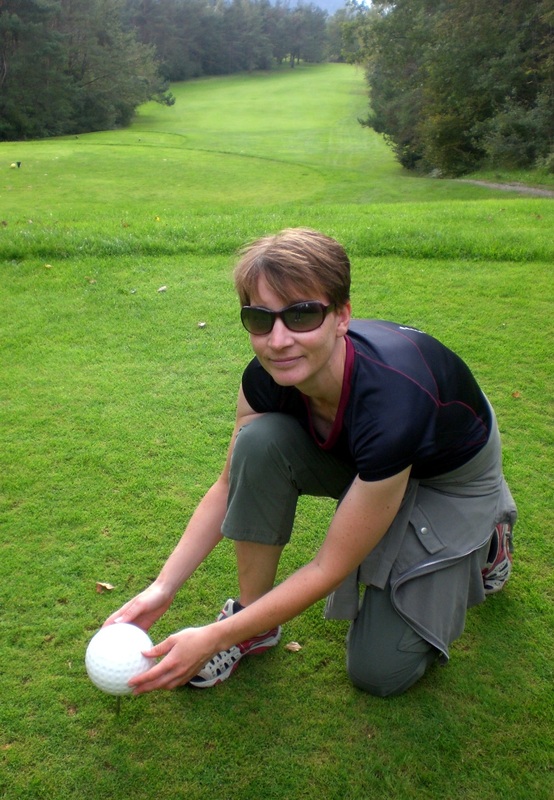 As she regularly plays golf at Bled Golf Course, we arranged to meet there and had dinner at the Lake House Inn. It was here that last year I also enjoyed a lovely birthday celebration with friends and family. As is to be expected on a golf course there are lush, green, tranquil surroundings, however here they come with the added bonus views of the surrounding mountains of the Karavanke range, all-in-all making for a very pleasant place to spend some time whether a lover of golf or not – oh and the food’s well worth coming for too! 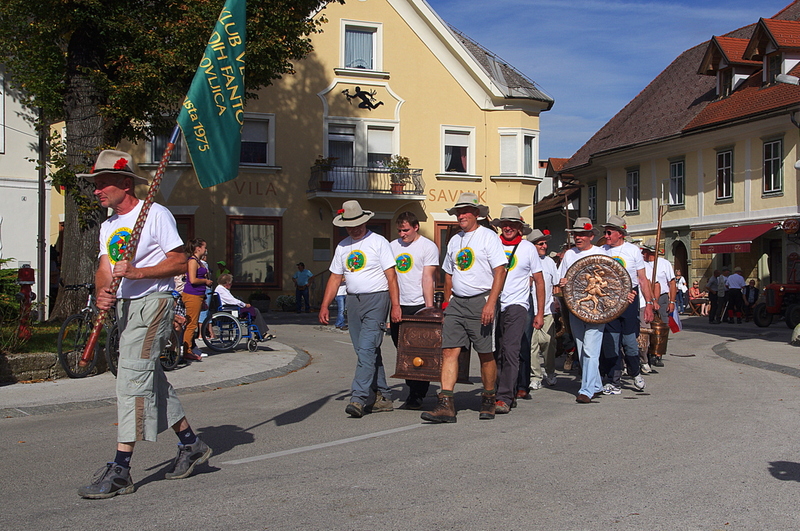 Being home to the Museum of Apiculture (beekeeping), Radovljica is inextricably linked with beekeeping and throughout the year there are several events linked to it. 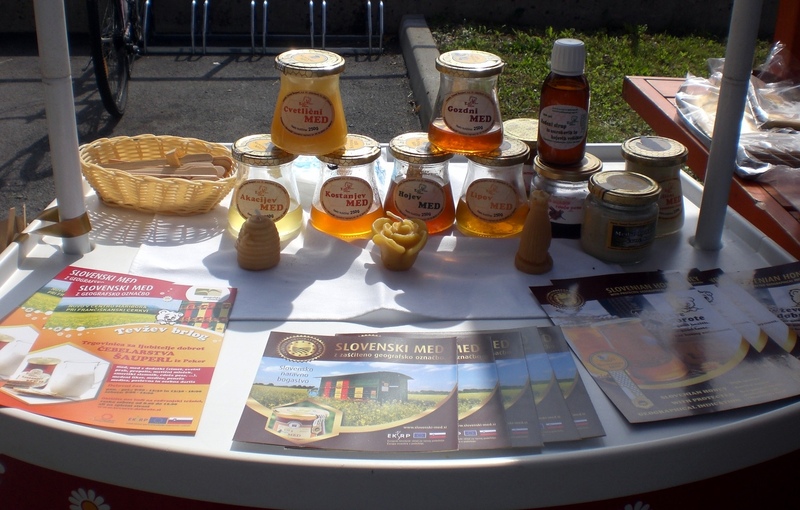 This weekend, it was the turn of the Festival of Honey, held at the Beekeeping Education Centre of Gorenjska, which is in Lesce, halfway between Radovljica and Bled. 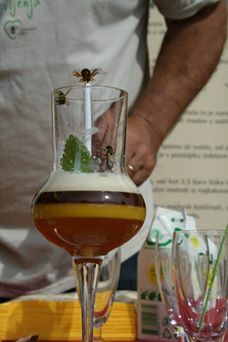 There was all mannor of honey relating things going on including a demonstration of cooking using honey from one of Slovenia’s top chefs, Uroš Štefelin, honey cocktail mixing, honey ice-cream, honey beer, massages using honey and more. They did our bees proud! 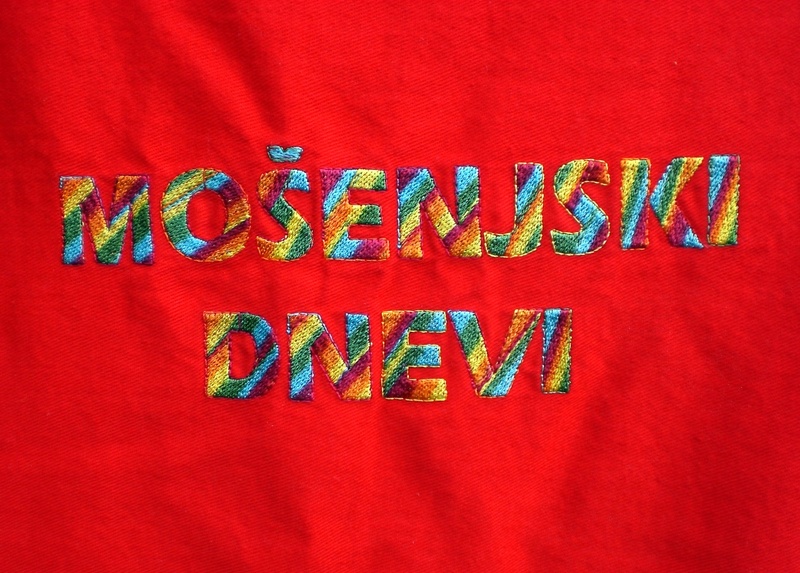 Also on Saturday, in the village of Mošnje, the annual Mošnje Days event took place. 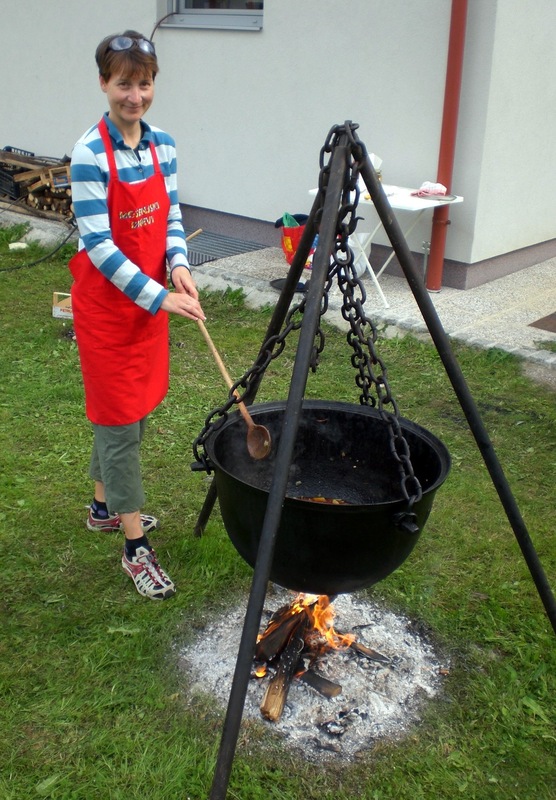 It’s a celebration of local food, drink and crafts, and also an opportunity to have a look at the village museum and the Vila Rustica archaeological site. I also bumped into Radovljica’s mayor there and shared a chat with him over a thimbleful of homemade walnut schnapps. We were both in agreement about being proud to live in Radovljica and about the achievements and progression that has been made here in the past few years – long may it continue (there are also more pictures of the day, as well as other things I have blogged about, on my Pinterest page). A super ‘sweet’ week ahead! 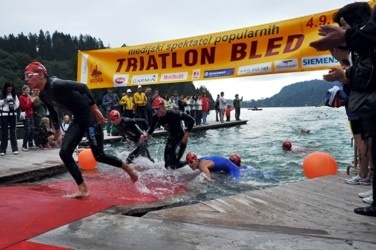 I decided on the title of this week’s blog for several reasons, not least of which because, according to the forecasters if they are to be believed, the weather gods may finally be shining on Slovenia this week, and for the whole week too. If that is the case, it hasn’t come a moment too soon as last week saw unprecedented (for this time of the year) floods in many parts of the country, landslides, and 35cm of snow in the high mountains. 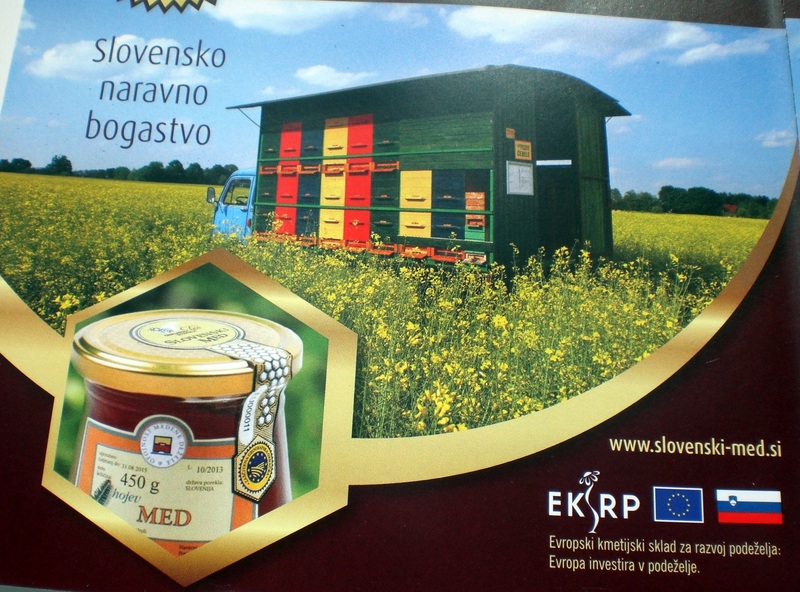 The second reason for the choice of title is that this weekend, on Saturday 20th September, the Beekeeping Education Centre of Gorenjska will host the Festival of Honey (Festival medu in Dan medu v kulinariki) from 9.30am – 6pm. 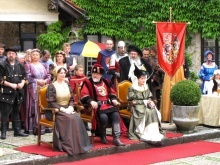 The centre is located in the town of Lesce, halfway between Radovljica and Bled. It houses a shop, which sells all kinds of honey, honey products and beekeeping requisites and a café where, during fine weather, you can enjoy a drink outside in the patio garden at the rear of the building where you can also see a beehive and watch the bees coming and going. As well as being interesting for visitors, the centre is also a hive of activity (pun intended!) for beekeepers as it offers them facilities to assist with the production of honey and its by-products; a honey bottling and packaging room, a wax processing plant. The centre is also used to provide training and education for existing and prospective beekeepers, as well as promoting beekeeping in Slovenia, one of the oldest and most traditional rural activities, and protection of the indigenous Carniolan bee species. The Festival of Honey is an annual event which celebrates all things honey-related and in particular aims to demonstrate its versatility. 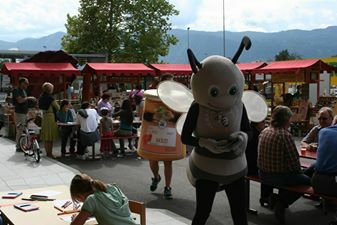 Throughout the day there is a market with stalls selling a wide range of honey and honey-related products as well as demonstrations of the use of honey in cooking, a cocktail mixing demonstration, honey massages, workshops for adults and children and more. The event is free to attend. With my sweet tooth, I’m bound to found lingering there somewhere! 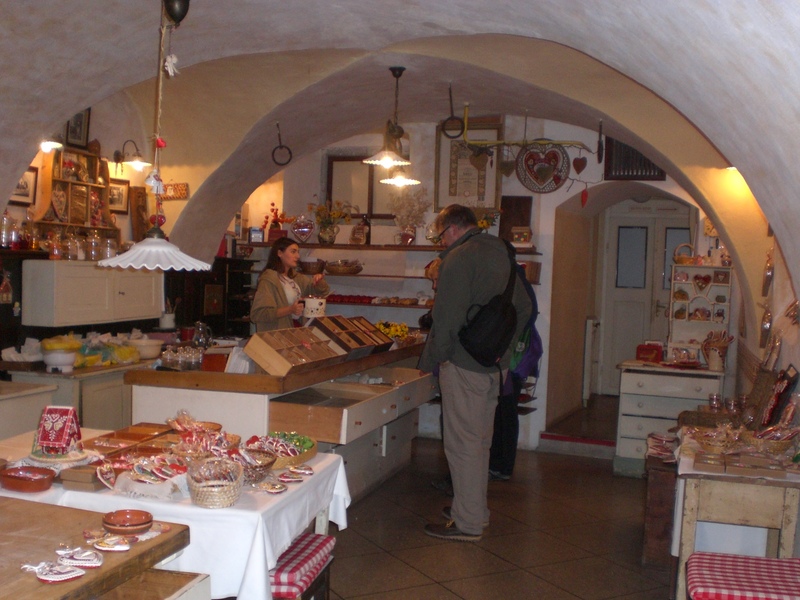 The Lectar Inn Live Museum and Gingerbread Workshop in Radovljica is another great ‘sweet’ place to spend a short while, come rain or shine. 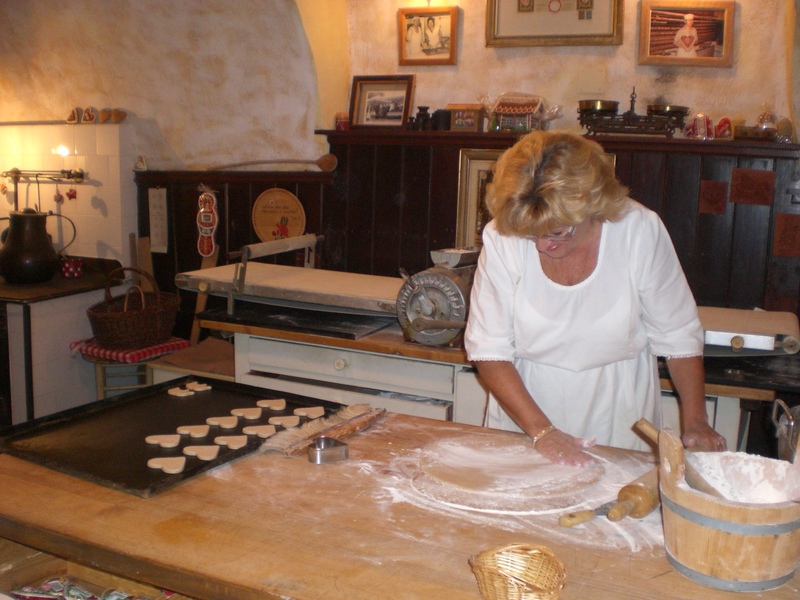 Despite having lived here now for over seven years, I still enjoy going there for a snoop around; the smell of the freshly baked gingerbread, watching the gingerbread makers at their craft, the friendly welcome, the staff dressed in traditional clothing. In fact I was there last Friday, together with Alison and her family from England. Alison had been searching for somewhere to go for a special holiday during which she, and two other family members, would be celebrating their birthdays, one of them being a ‘special’ birthday. She had never even considered Slovenia but having stumbled upon my blog, the decision was made (oh, the pressure!). There followed several months of correspondence whilst I helped her put together the perfect itinerary for their trip. So, of course after all those emails back and forth, we felt like old friends and it was lovely to meet up, proudly show them around my home town, and enjoy a meal together. 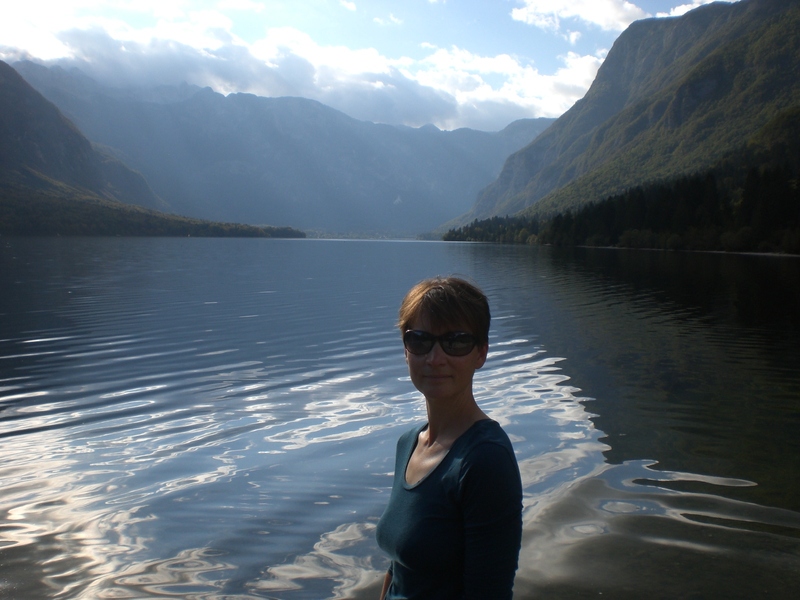 Their trip covered most of Slovenia and whilst in this area included a guided two-day hike in the mountains (the plan was Triglav but the weather had other ideas), a steam train ride, dinner at Bled Castle, a guided photography tour, a visit to Vintgar gorge and to Bohinj Lake. Their trip also encompassed visiting Ljubljana, the Soča Valley and the coast and, hailing from Wales, they certainly didn’t let the weather stop them – I’m so pleased that it all worked out. The third, and final, reason for the title is that this coming weekend is one of my favourite events of the year, the Istra Sweet Festival (Sladka Istra). The festival, which takes place at the coast in the town of Koper, is a feast of sweet treats of every size, shape and flavour imaginable – cakes, pancakes, biscuits, chocolates, drinks and more – basically the sweeter the better! The festival takes place over 2 days and the date is always firmly noted in my diary. This year, there is also a Coastal Bike Marathon happening on the same weekend and, all being well, I am aiming to participate in that – so I can eat even more sweet stuff of course! More about that next week! Suffice to say, the weather last week still wasn’t conducive to much in the way of hiking and biking (though the start of this week has so far been much improved), so, in such times, I turn instead to food – my other great love! I enjoyed a great meal with friends at Joštov hram in Podnart. Blink and one could easily miss this small and, from the exterior, unprepossessing restaurant, which is tucked away in the Lipnica valley beside the Sava river. However, it really is worth making the trip there, both for the delicious food and for the warm welcome and hospitality received. My advice would be to leave it to chef and proprietor Miso, ably assisted in the kitchen by his mother, so a real family affair, to work his magic and rustle up a selection of the delicious Balkan food on offer. I’m sure, like us, you won’t leave disappointed and certainly not hungry! Joštov hram is just one of the restaurants that participate in the Taste Radol’ca collaboration which I have written about extensively in previous blogs and more information can also be found under the ‘Taste Radol’ca’ header at the top of my blog. 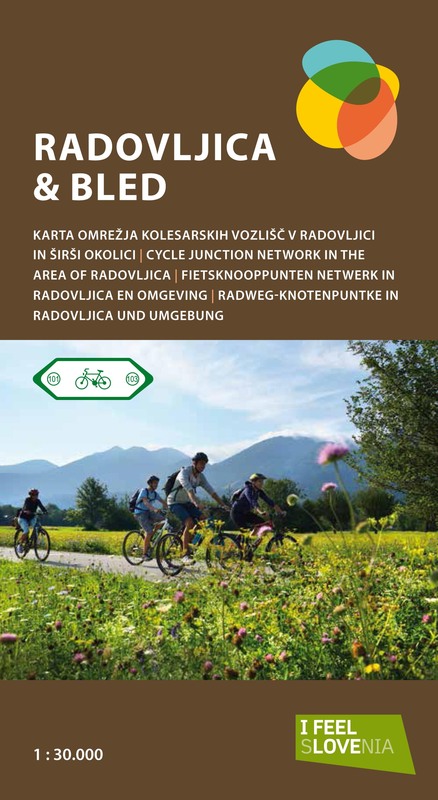 From this week, a new cycle map covering Radovljica, Bled and the surrounding areas will be available. The project came about thanks to a local, Blaž Bole, who saw a similar scheme in operation in the Netherlands and he, together with a team of volunteers, set about planning and installing a network of cycle signposts around the area. Having done the English translations for the map I have been lucky enough to be a part of its development and we are all justifiably delighted with the finished result. The number of signposts, each with its own number, has been added to gradually over the past 2 years, and now finally this map connects all the numbers and offers a wide variety of cycle routes in the surrounding areas. Cyclists can easily plot their own routes, choosing how long and far they wish to cycle, or there are also 10 suggested routes varying in length and difficulty; the shortest route is 25km with a 639m total height difference; the longest 99km with a whopping 3094m total height difference. Sights and places of interest along the way are also marked on the map, which, from this week, can be obtained free of charge from the Radovljica Tourist Information Centre. I have personally cycled all but one of the routes, the exception being the longest one although I have cycled most of that one too, and would be hard pushed to choose a favourite as each one is wonderfully scenic and varied. On Saturday 13th there will be a concert performed by the Lipnica choir, to mark the day of the local holiday celebration. The concert will take place under the village linden tree in Kamna Gorica, beginning at 5pm and is free for all to enjoy. Right, I’m off for a walk to make the most of this glorious sunshine – wow, I haven’t said that for a while!!! 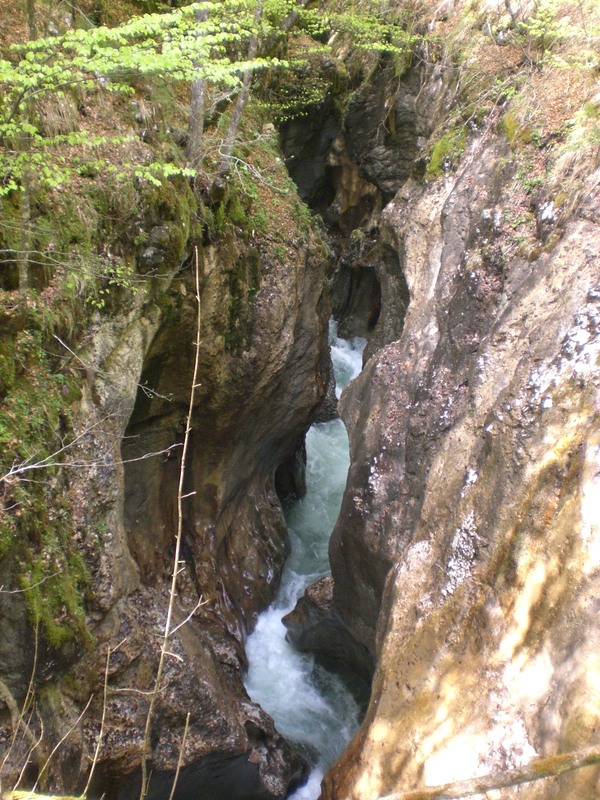 Zelenci Pools, Ljubelj Pass, and ‘Forever Young’! It was brief but great whilst it lasted, which could perhaps be said of many things in life! I am, however, referring to the brief return of ‘summer’ that we enjoyed last week. It began on Wednesday when, after a very cool start to the day, late morning all of a sudden the clouds lifted, the sun broke through and it felt warm, hot even. Oh how I rejoiced at seeing the blue sky, feeling the sun’s rays on my all-too pale skin and I felt my mood instantly lifted. There’s one thing for sure, when you haven’t had, or seen, something for a long time, you certainly appreciate it even more. Alas, it didn’t last and thus only served as a reminder of what we have, this ‘summer’ missed out on. As I sit writing this on Monday morning, it’s currently 10 degrees out there and I can see snow on the tops of the mountains brrr…..
Unsurprisingly then, I didn’t waste a minute and since it was a slack week workwise, I was able to cram in quite a few walks and bike rides. So here is the run down, which I hope will also offer some ideas for short walks and bike rides around the area. On Wednesday afternoon I drove to Trzič on onwards to Ljubelj for a walk up the old Ljubelj pass. Prior to the building of the Karavanke tunnel from Slovenia to Austria in 1991, all transport from the Gorenjska region towards the Ferlach region of Austria used to travel over the Ljubelj pass which passed over the Karavanke range reaching a height of 1370m. One can only imagine how painstakingly slow the journey must have been, particularly in days of old when cars didn’t have as much grunt as they do nowadays. 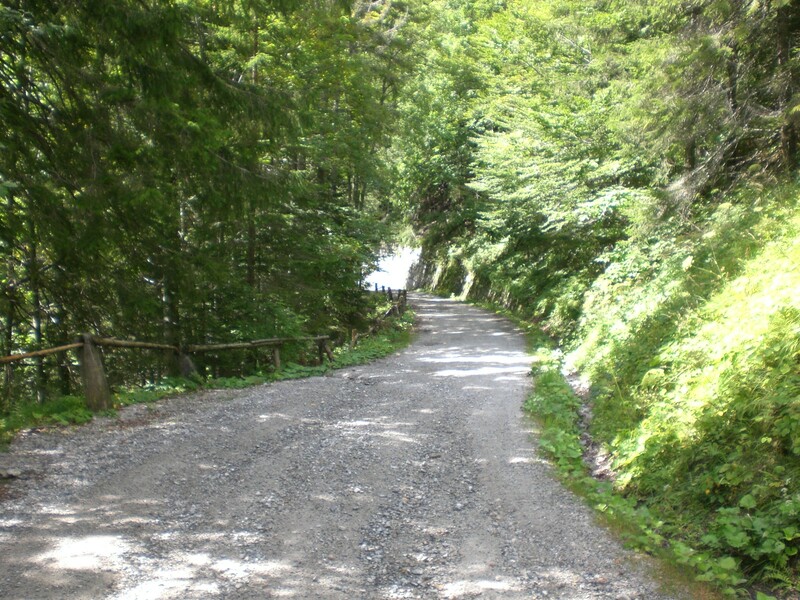 The original road, which is now only suitable for walking as well as being a popular destination for sledging in the winter, closed to traffic in 1967, when an improved, wider road was built, which is today still in use, though less frequently so with many choosing to drive through the Karavanke tunnel instead. The Ljubelj tunnel was built on the order of Nazis by civilians and prisoners from the nearby Mauthasen concentration camp. 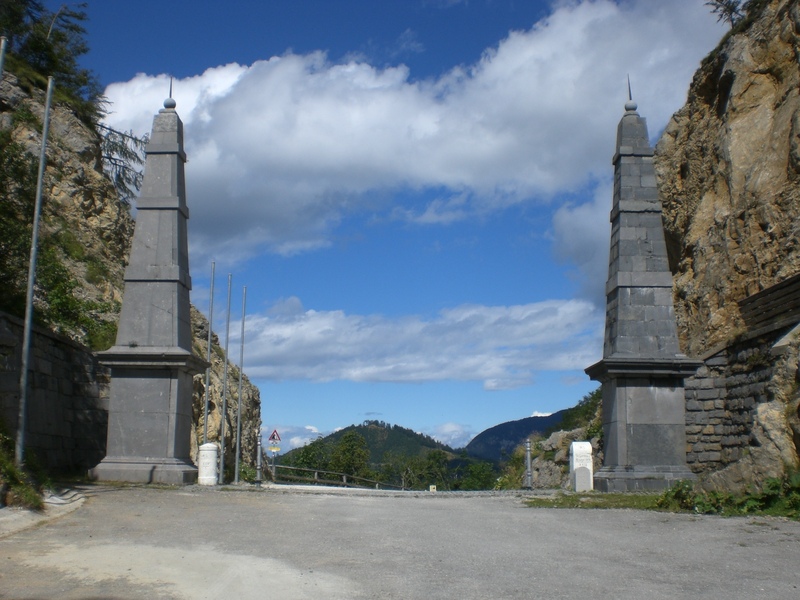 Today, the remains of the concentration camp still stand just beneath the Ljubelj pass, where one can stop at the memorial to see the site and take a moment to ponder the horrific lives the prisoners there endured. 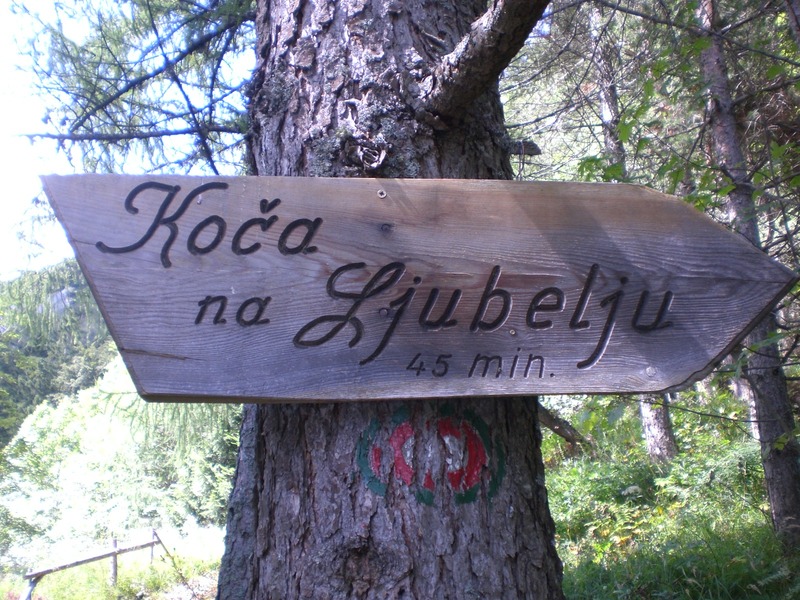 Today the mountain hut ‘Koča na Ljubelju’ is a popular destination in itself, and takes only around 45 minutes to reach from the parking area, as well as it being an onward point for hikes on both the Slovene and Austrian side of the Karavanke. 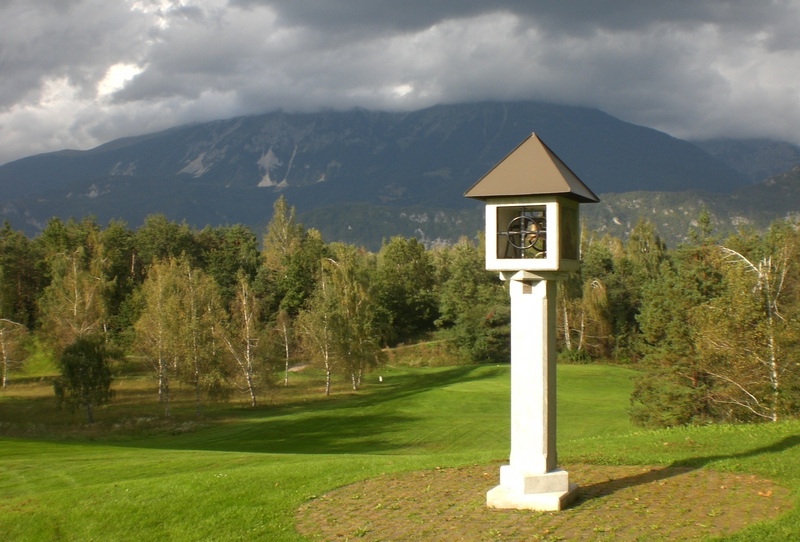 The two obeslisks, as seen below, mark the border between the two countries and one is spoilt for choice with views across both Slovenia and Austria,. Thursday morning began with a ride to the Završnica reservoir followed by a walk up to the Valvasor mountain hut (Valvasorjev dom) which sits at 1181m, on the slopes of Mount Stol. 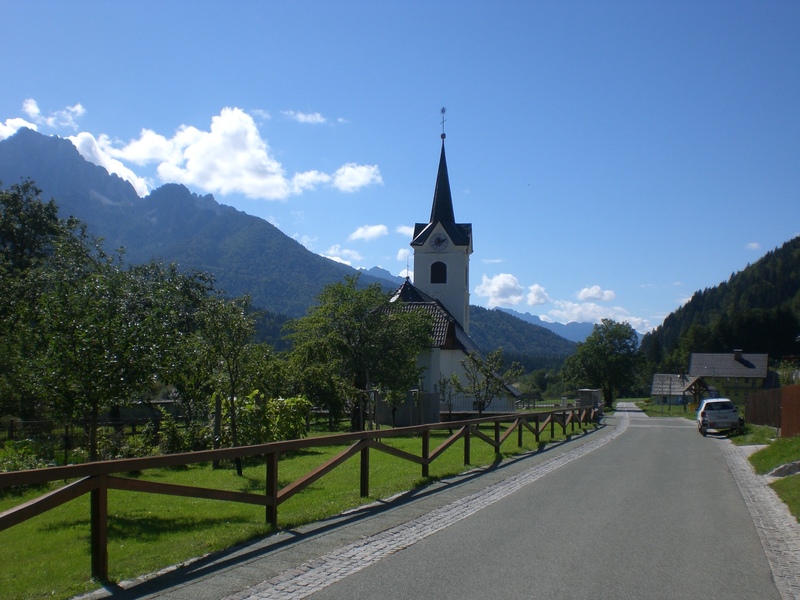 Not content with just that, in the afternoon I drove to Kranjska Gora from where I walked across the pastures to the picturesque village of Podkoren, which is particularly popular with skiers in the winter, and from there onwards to the Zelenci springs. These emerald green pools are known for the springs which rise up from the bottom of the pools and for the water temperature which remains at 5-6 degrees year-round, regardless of the air temperature. 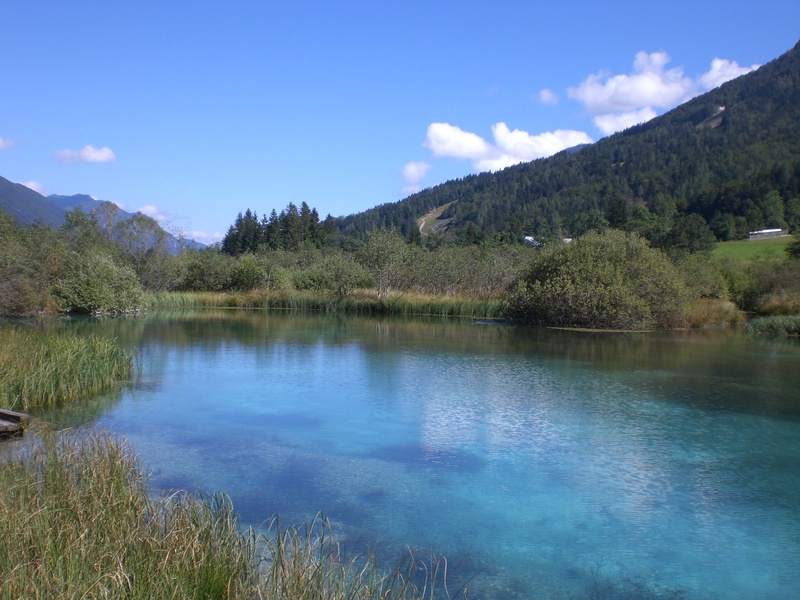 The clarity of the water, the stunning surrounding alpine scenery is reflected in the pools and it is a wonderful place to enjoy a moment of calm. On Saturday morning, after cycling to the Draga Valley, I hiked up to the Preval highland then took the route ‘čez Roža’ to reach the Roblek mountain hut, (Roblekov dom) at 1672m. Sadly, the path from Draga to Preval, particularly the lower half of it, is currently in a pretty bad state and barely resembles the pleasant path it once was due to the ravages of this year’s winter. The path from Preval to Roblek however was improved last year and remains as scenic as ever. 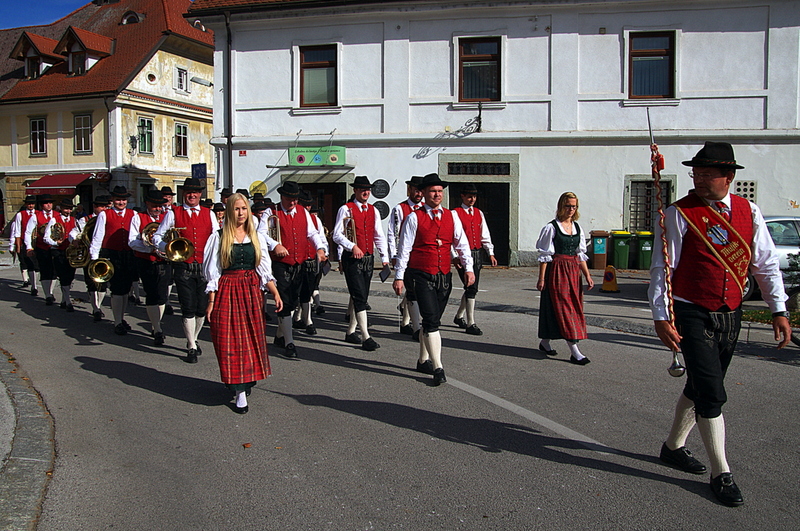 On Saturday afternoon the Večno mladi (Forever Young) parade took place through the streets of Radovljica. 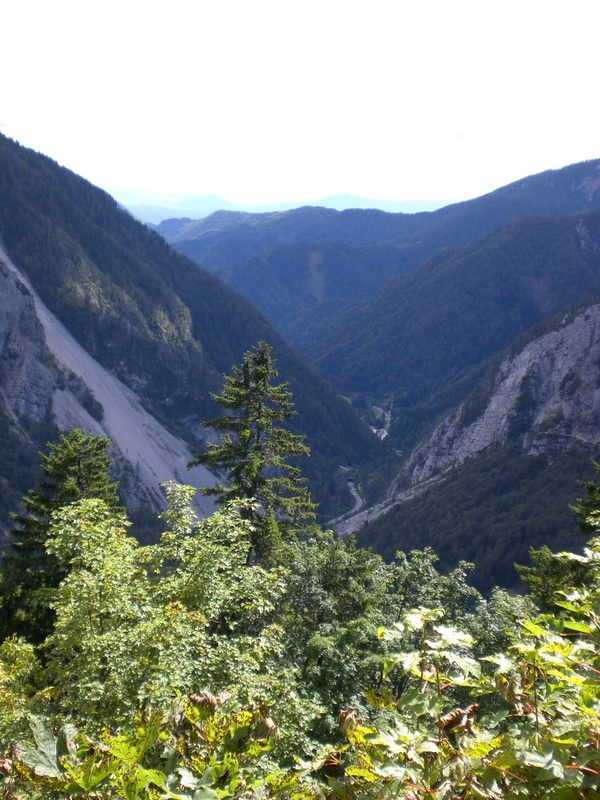 This event, which has been taking place annually on the last weekend in August since 1975, begins with a hike for the club members to Stol, the highest peak in the Karavanke range. 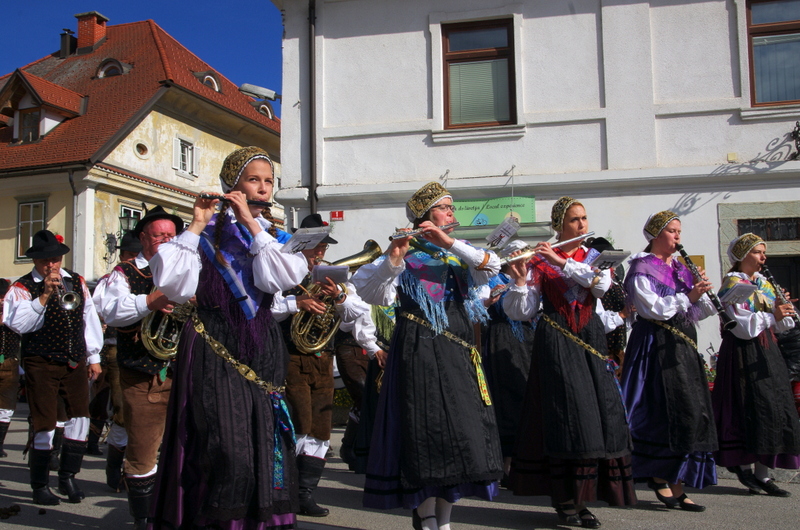 The remainder of the entertainment, comprising a parade through the streets of Radovljica complete with marching bands, Slovene folk music, old-timer bikes and cars, is open for all to enjoy and participate. The festivities then continue into the night with a concert and fireworks display on the Saturday evening. More pictures can be found of this, and other such events and places, on my Pinterest page.